If you want to start performing pull-ups, chin-ups, etc., there are quite a few mobility demands on the upper body that need to be present in order to perform properly and without increased risk to joints and other soft tissue structures. Once you have the pre-requisite mobility requirements, we need to make sure you can control these ranges of motion. You can have all of the mobility in the world, but if you can’t control it then it can be an issue. To assess if you have sufficient overhead stability or control of those ranges of motion, we are going to look at active mobility or you moving your body vs before with our mobility assessment of passively looking at mobility. 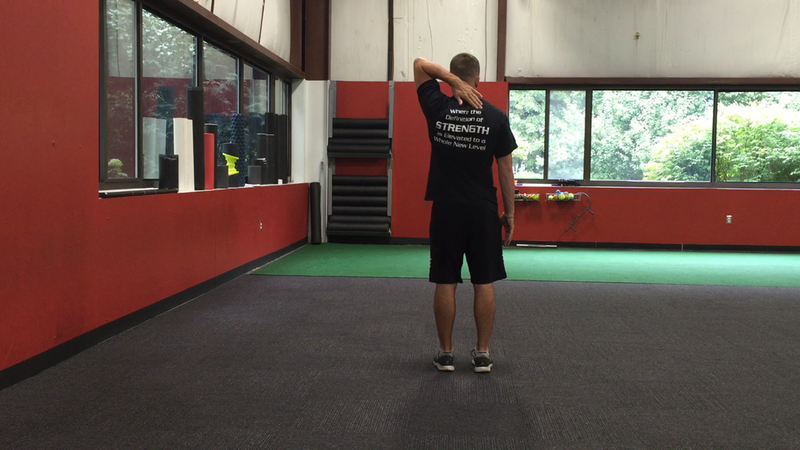 The first test we want to look at is Active Shoulder Flexion. This assesses to see if you can reach fully overhead and without compensating. When we perform this, we want to make sure the arms can get fully overhead. Typically, arms in line with the ears is a quick measure to see if you can get them overhead. With that being said, we need to make sure an athlete isn’t compensating elsewhere throughout the body. You can also perform this test by standing against a wall. Make sure your low back is against the wall and raise your arms overhead. Can you get your heads comfortably to the wall? If so, then you know you can sufficient overhead shoulder flexion for overhead pulling. Another great test is to reach up behind your head and try to reach your opposite scapula (shoulder blade). If you can, this is another test that is easy to perform and great at assessing someone’s ability to get their arm overhead. -Pull rib cage down towards belt line. -Create space between shoulder blades by pushing chest away from the ground. -Bring hips up by pushing ground forward with arms. -Perform slow and controlled on the way up/down. -Think of pushing the ground away from you on the way up. -Perform for 2 sets x 10 reps.
-Use a light weight ie. 5lbs. -Perform slow and controlled for 3 sets x 5 reps.
Now that we have covered the shoulder, the next area to consider is the thoracic spine. From Part I, if you have full thoracic spine mobility, you need to make sure you have full thoracic spine stability or motor control as well. Ideally, we like to see at least 50 degrees of full thoracic rotation actively. That is approximately ½ way from the starting point to the trunk being vertical to the horizon. -Sit hips back onto heels. -Rotate through the mid back. Make sure not to side bend through the trunk. -Knee at or above hip height. -Allow kettlebell to assist you into thoracic rotation. Now that we have covered the shoulder and thoracic spine, we cannot forget to address the core and it’s position in the pull-up or chin-up. The core/trunk position will dictate what will happen above and below it. 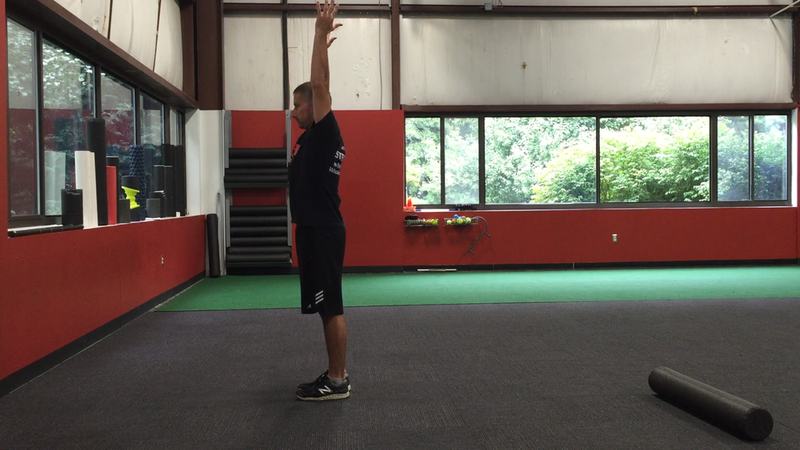 If the core/trunk position is not ideal, then it can negatively affect the thoracic spine and the shoulder. If someone has full shoulder and thoracic spine mobility and stability, then assess them performing it actively in standing. With this test, we want to watch for a rib flare and/or lumbar hyperextension or hinging at the lumbar spine. If someone can pass the mobility and motor control drills at the shoulder and thoracic spine and demonstrate this type of movement pattern at the trunk, then we can suspect that implementing some motor control drills at the core can improve this. -Deep breath, breathe out and pull ribs down towards belt line. -Maintain this position, don't allow ribs to come up, and bring kettlebell overhead. -Perform for 2-3 sets x 6-8 reps.
-Push ground away from you. -Lift knees slightly off ground. -Make sure ribs are pulled down towards your belt line. -Think of pushing the ground away from you as you bring your hips up in the air. Those drills also work on shoulder overhead stability and control as well as shown before. Both are great drills for working both shoulder and core position. If you present with full mobility, but have a difficult time controlling it, try implementing these drills into your routine. Make sure to stay tuned for part III of the Demands for Overhead Pulling.